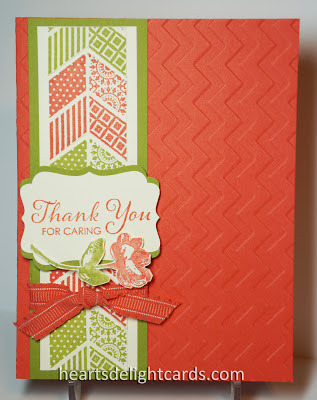 Cut Calypso Coral cardstock to 5-1/2" x 8-1/2", fold in half and emboss front with Chevron embossing folder. Cut Old Olive cardstock to 1-3/4" x 5-1/2". Cut Very Vanilla cardstock to 1-1/2" x 5-1/4". Stamp chevrons from Oh, Hello stamp set on scrap of Very Vanilla (Old Olive x 3 and Calypso Coral x 2) and trim closely with Paper Snips. Adhere chevron strip to Old Olive panel with Snail Adhesive. The Calypso Coral Ruffled Ribbon is now retired, so find a suitable 8" length of ribbon, wrap it around panel near bottom and tie a knot (a square knot, if you know how!). Use Snail adhesive to fasten panel to card front. With Calypso Coral ink, stamp "Thanks for Caring" from Lots of Thanks stamp set on a scrap of Very Vanilla and punch with Decorative Label Punch. Punch Old Olive scrap with same punch, cut in half and adhere to back of stamped greeting. Using Calypso Coral and Old Olive Stampin' Write Markers, color flower stamp in Oh, Hello set and stamp on Very Vanilla scrap. Cut out and adhere to bottom of greeting label. Use Stampin' Dimensionals to fasten greeting label to card front. This layout would lend itself to lots of other color combinations and stamp sets, as well. You could even use a strip of designer series paper instead of the chevrons! Great card. It would brighten up anyone's day. I love the look of this! Was it hard to line up those chevrons so perfectly? Great tip for framing the greeting with the Decorative Label punch.